If my life were to be made as a movie, in all probability I would still be playing a not-so-important side character. If I ever write a SOP, it would never resemble this (if you are going to read only one blog post today, I recommend you read the one that is linked). Admittedly, not many of us get to live a life that is movie-worthy. But, there are few moments in each of our lives that we remember for ever. I have described one such fond memory from my schooldays. It was July 1999. I had just completed my 5th class, and our family had shifted from Thiruvanmiyur to Tambaram. Kendriya Vidyalayas work in a unique fashion (unique relative to other schools in the southern part). As soon as an academic year is over, students have an one-week vacation. Following this, the academic results are declared during the first week of April, and the next academic year is started. The summer vacation starts at around first week of May and extends for two months. Usually, a student can request transfer from one KV to another quite easily. Knowing this, we had shifted to our new house at the end of March. Unfortunately (fortunately from my perspective) my transfer got delayed, and I was asked to attend my old school at Adyar for the month of April alone. Since it was impossible to imagine a daily journey of more than 40 kms, it was decided that I would simply bunk one month of school, and join my new school only after it reopens from the summer vacation. For someone who has always dreaded the prospect of going to school on a Monday, and has spent most of the time in his two years of professional career counting the number of days left to the next Friday, rejoining school after a three-month long vacation is never easy. And the very idea of a completely new environment had me totally scared. In the first few weeks in my new school, I had quite a few challenges. Most importantly, there was Hindi. I had a chronic fear of Hindi and Hindi teachers. As an example, in my 7th grade I promptly replied to a Hindi sir's question of "where is your holiday homework" with a "Tumkohi diya tha" (I have give it to you only). He politely requested me to bend down, and smacked hard on my back for primarily two reasons - firstly because we are supposed to address elders as "aap" (the more respectful form of "you") and not "tum", and secondly because I had lied. To compound this innate fear of Hindi, my Hindi teacher was quite disciplinarian. She had a furious temper, and she spoke only in Hindi. I don't remember every little detail of those nerve-wracking moments, but I somehow ended up sitting near this nice and friendly little guy "V". In retrospect, my perception of his niceness was probably increased by the fact that he was little - an inch shorter than me to be precise - and stood as the second person when arranged by "height-order" for the school assembly (I would be third). But seriously, V was quite nice. He gave me quite a few tips on how to handle my Hindi teacher. He even coached me with the exact Hindi sentence I should use to get my handwriting approved from her ("Likavat teek hai, madam?"). Then, there were the monthly tests. Since the syllabus for a whole month had been completed, we had our first monthly test as soon as school reopened. I was clueless about any of the subjects, but managed to scrap through a few of them. 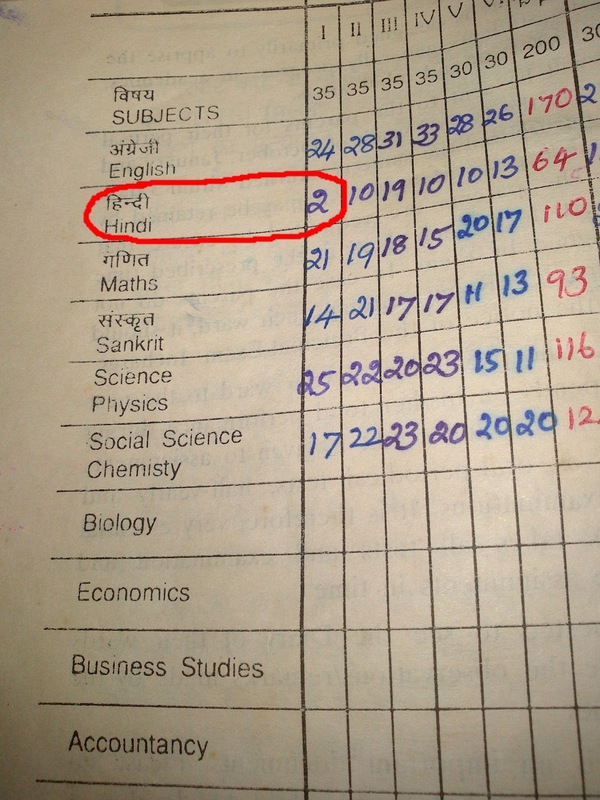 When it came to Hindi, I couldn't even make head or tail out of the syllabus. I turned to my by-now-close-friend V for assistance, and asked him to list out the chapters I had to study. He helpfully took my book, and marked the name of a single poem with his pencil. Having diligently studied the poem word-by-word, I entered the exam hall filled with a high amount of out-of-character-optimism, which was shattered when I glanced at the question paper. I realised that the poem I had so thoroughly studied was only a minor part of the syllabus. The result of the exam? Please refer to the image below. Finally, there were the seniors. 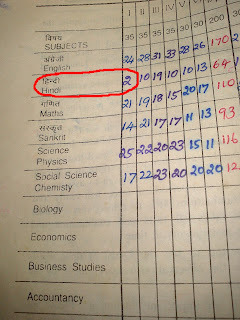 Back then, Kendriya Vidyalayas didn't believe in "retaining" students till 6th grade, and every student scraped through . Once we entered the 6th grade, we were made to face the "harsh realities of the competitive World outside", and a lot of students were forced to redo the year. As a result, we had quite a few 'Annas' in our class, who had to be talked to with deference. One of these Annas - let's call him "A" - happened to be the only person living anywhere near the vicinity of our house. In order to make-up for the one month I had lost, I had to borrow notes from A (which were almost always incomplete). On one such occasion, I visited A's house to borrow notes. I met his Mother, who seemed quite pleasant. Being a shy and reserved person, I was determined to strike a friendship with A, and willed myself to be at my extroverted best. However my best was not good enough, and it was time for me to leave without having conversed much. As I removed the side-stand of my BSA cycle, an inspiration struck me. I turned towards A, and asked him how much he had scored in his Hindi test. Even before he could react, his mother overheard me, and came rushing out, asking me if our marks had been distributed. Proud at my new-found-ability to strike conversations, I nodded my head, and voluntarily told her how much I had scored. She consoled me (though I didn't need much consoling) explaining that I needed time to get used to the new environment, gave an affectionate glance towards her son (in retrospect, it could have been more of a furious frown), asking him how much he had scored. He replied without any trace of pride (understandable, as he hadn't scored as highly as I) that he got zero. Not wanting to over-exert my friendliness, I chose this moment to cheerfully wave them both a goodbye, and start home. Soon after I left, I heard a couple of noises - a slap and a shriek of pain. The aftermath? For reasons unknown, I had to suffer some intense bullying from A for the next two years. Lessons learnt? More often than not, truth leads you into miseries. Honesty is not always the best policy.